Your home is the place where you can be renewed so that you can go back out into the world and do whatever you do. Consciously or unconsciously we organize our homes so that our surroundings help us out. 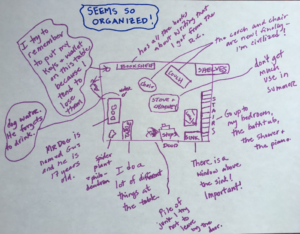 Draw a map of your living space. Label the different parts. Add information about how they are organized to make you comfortable, keep you healthy and keep you safe. You can include your furniture, your pets or roommates, your silverware, your toothbrush or anything at all that is important to you in your home.